You may recognize them as the hosts of the forthcoming London CS:GO Major. 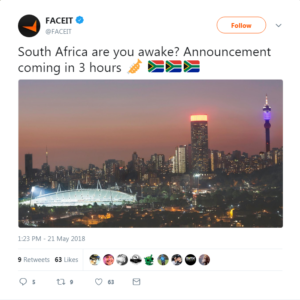 FACEIT are an organizer of huge tournaments and are responsible for the prestigious ECS CS:GO League. Their core business, however, is as a pickup game service and platform that is in direct competition with ESEA in most other markets. FACEIT boasts over 12 million unique matches every month across all titles, which is a rather massive number. 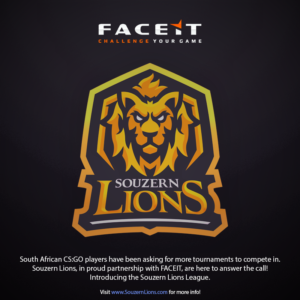 In South Africa, they are initially focusing exclusively on CS:GO in partnership with Souzern Lions. Or perhaps it’s the other way round? Either way, it is potentially big news for the local competitive scene. It’s meant for individual players, rather than as a league for established teams. It’s an incentivized pickup game system, which I think is a wonderful idea. There are Bronze, Silver and Gold divisions that players will have to work to progress through. Gold League is intended as the pinnacle, where the very best local players take each other on for the largest of the rewards. Players will have to grind to earn an invite to Gold League or qualify through their monthly Challengers Cup events. There are actual cash prizes as well as FACEIT points that can be used to buy in game and real world items on the FACEIT online store. Souzern Lion have graciously given us a 50% off promotional code you can use when you sign up for the Souzern Lions League. Use promo code “esportscentral” to get half off on your first month’s subscription fees. We’re certainly very excited to watch their progress in the local scene and especially to see what future tournaments they bring to these fair shores. Happy pugging!